Join the discussion on our forums! Come discuss Splitting Festeroot over in our dedicated Splitting Festeroot discussion topic. You have to admit, though, that minions with two levels of resummoning are rare; Piloted Shredder, Piloted Sky Golem, etc. only summon 1 minion upon death, 2 if you're fortunate and spawn Jade Swarmer, Infested Tauren, etc. The only other minion with a comparable level of stickiness is Carnivorous Cube, which if played on Piloted Sky Golem summons a 4-cost minion and upon death summons 2 6|4 mechs that themselves summon 2 4-cost minions upon death; this is very strong. That counts for 3+ layers, + because the shredders can summon more shredders, for example. BUT if you play the Cube on Groot, you summon 2 teenage Groots (see the most recent MCU film for reference) that summon 4 baby Groots (see an earlier Guardians film) upon death, while the Cube itself upon death summons 2 mature Groots that summon 4 teenage Groots that summon 8 baby Groots. It's a Groot factory. That's four layers to go through, that's A LOT of required play to remove all of that. "I am Groot". Yes, you are. If played in a Quest Priest deck, oh my... Twilight's Call, Eternal Servitude, Resurrect, Greater Diamond Spellstone... N'Zoth, the Corruptor. What madness is this, you ask? The sylvan guardian looks at you meekly. "I am Groot," it responds. opponent: "I play this wood stick"
me: "haha, that's it? I'd just break it in half"
oppenent: "then I get 2 sticks"
oppenent: "stick wins every time"
Everyone laughs at this card until "Monsters behind you"
I will put this in a Master Oakhart deck that will pull a Silver Vanguard that will pull this card that deathrattles into 2 2/2s that deathrattle into 2 1/1s. In all seriousness, cards like these arent supposed to be powerful standalone cards. They're supposed to be really strong with other synergistic cards. I honestly like the card and the flavour it brings and I think its going to do pretty decent in those said decks. 8 mana, 12/12 stats when all said and done. Very sticky. Good card. Sadly an epic though. 5 mana, that the heck? granted, units in mtg die a little harder than in hs, but still! From what I found, Mitotic Ooze doesn't see much play. Although, that was a quick Google search. If it turns out this thing is tier 0, let me know. okay now that i know it becomes a 2/2 that becomes 1/1's it's much better than i originally said but it's still slow as hell and 8 mana for a 4/4 body is still meh...Maybe the kobold illusionist will see play with this card? This is used to finish the Priest Quest fast. It's a really sticky body if you can cheat it out somehow. All I can come up with right now is recruiting it with Silver Vanguard. as someone mentioned above, "monsters behind you", or dollmaster dorian; unless you actually want the 4/4, in wich case yeah, not many options. Should have made the woodchips split into 0.5/0.5s. Then into 0.25/0.25 and so forth until the servers overload with minute minions and the game crashes, thus making you victorious. Don't do it man, Toast can't go back to Blizzard jail. You all laugh, but there will come a time when your opponent will play this and you need to clear their board, but you can't. I don't think enough people are paying attention to the names on this card. 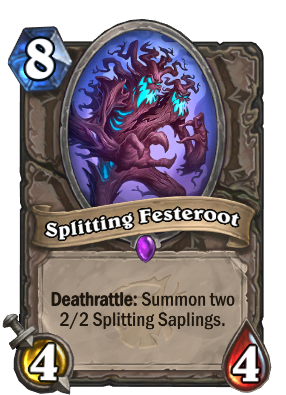 The name of the card is "Splitting Festeroot." 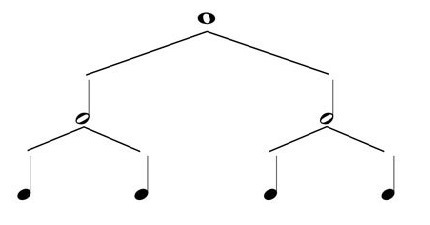 The tokens are named "Splitting Saplings." 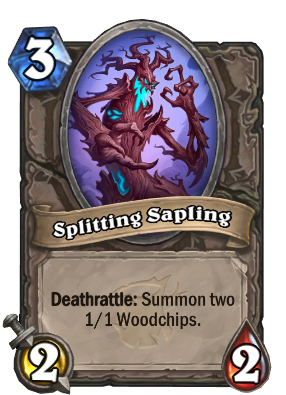 I would bet the farm that the two 2/2 tokens this makes have "Deathrattle: Summon two 1/1 Saplings." If so, this card is a heavy sleeper and could be a key component in tailored fringe decks. Eh.. it's okay 4/4 stats on an 8 body is bad it's technically an 8 mana 8/8 but the death rattle has a good amount of synergy with other cards soo... it might see play if you can cheat it out enough.